It’s still not safe to go back in the water. Forty years ago, on June 1, 1975, JAWS hit theaters and made millions scared to dip their toe in the ocean. Now, thanks to Fathom Events the Steven Spielberg classic will be coming back for a limited engagement. Tickets go on sale May 29 for the shows which will happen on June 21 and 24 at 2pm and 7pm. That’s right folks – you get four chances to see this. Enjoy a specially produced introduction from TCM Weekend Daytime host Ben Mankiewicz that will give insight into how this classic still makes us think twice about jumping in that water! Dare to relive the terrifying masterpiece? Fathom Events, Turner Classic Movies and Universal Pictures Home Entertainment invite you to celebrate the 40th Anniversary of the one of the most popular American thrillers of all time when Jaws (1975) returns to select cinemas nationwide for a special two-day only event on Sunday, June 21 and Wednesday, June 24 at 2:00 p.m. and 7:00 p.m. local time. Not too shabby. I’m all for this. But I’m also a bit spoiled. 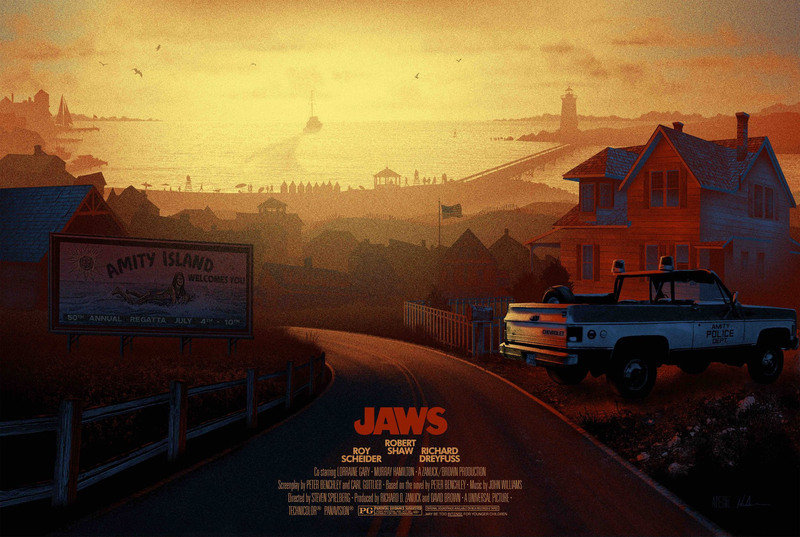 I have an art house theater (The Strand in Clinton, MA) near me that plays JAWS every year around the fourth of July and I make it a point to go every year. This is the perfect theater for that kind of movie, an old-school throwback kind of theater. I have to admit that the idea of seeing this on a big screen in a high-def theater makes me a little weak in the knees. I know I’ll be going to at least one show, if not more. How about you, readers? Will you be hitting any of these limited showings? This entry was posted in Breaking News, Film and tagged jaws, Steven Spielberg. Bookmark the permalink.